I’ve always loved my mom’s meatball recipe. I don’t know where it came from, but it was typed onto an index card by my grandma many decades ago. It’s very simple and easy, and only requires meat in the form of ground beef. These meatballs taste like my childhood. Of course, in recent years, I’ve doctored them up a bit—but only to boost the nutrition content. The secondary goal of my “doctoring” was actually to keep them tasting exactly the same as always. My Mom was just here for a week (and she got me totally organized in the kitchen and otherwise, but that’s another story), and she agreed with me that we succeeded at this meatball feat! They are awesome! I’m pretty picky about the ingredients I use in my recipes, and because it can be a pain to get things like the highest quality beef liver locally, I always check here online to buy my supplies. Note: This makes A LOT… the reason I make this much at once is because my beef liver comes frozen in one-pound packages so when I thaw it out I need to use the entire thing. Directions: First (this is the gross part), rinse the beef liver and puree it in the food processor. Add it to a large mixing bowl with all of the other ingredients. Next (this is the other gross part), use your hands to mix and squish the ingredients together until well blended. In a frying pan, melt a couple tablespoons of butter on medium. Make your mixture into balls and brown the outsides. Finish cooking in a pot of spaghetti sauce (or freeze to finish later). I love this sauce! I freeze these meatballs in packs of three so when I want them, I can take a pack out of the freezer at night and use it for lunch or dinner the next day. 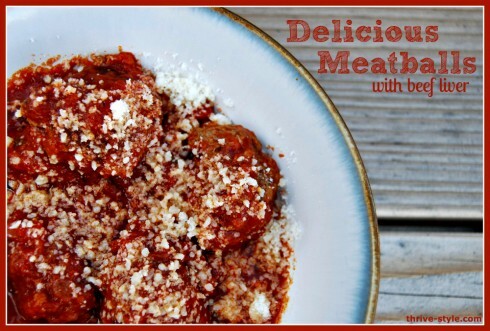 Are you a meatball lover?? I could eat them everyday… and I sometimes I do! I love that they can be a vehicle for beef liver since I am not crazy about the taste of that. (If you want to learn more about beef liver and ways to eat it that taste good, please visit this post!). Ahhh thank you for this! We’ve been trying to eat more liver, but ugh. Zak doesn’t mind it (he ate it as a kid and says it reminds him of his childhood!) the texture is just so hard to get over. I’ve thought about you putting liver in meatballs more than once… thanks for a post dedicated to the topic. I’m going to try this soon!